Yesterday’s post about Auckland’s Central Motorway Junction got me thinking a bit – what if we hadn’t gone down that path? What if we hadn’t rammed a massive motorway junction through the centre of our city? Could we have done things a bit differently and would the final product have ended up better? They’re interesting questions to look at actually. One of the big problems with Auckland’s transport situation (apart from our auto-dependency) is that there is a big conflict between traffic trying to get to the CBD and its surrounding inner-suburbs (where a big chunk of the city’s jobs are located) and traffic trying to travel from suburb to suburb – or simply from one side of the city to the other for more long-distance purposes. To get from one side of the city to the other you need to travel right through the centre of Auckland, so you add to the congestion that is already being caused by people trying to get into the centre of the city. This situation will be alleviated by the completion of the Western Ring Route, which is now being built at a pretty tremendous cost and is sucking money away from public transport projects – but that’s another story! It’s not altogether uncommon for a city to take another approach to what Auckland did. If we look at Vancouver in Canada, we can see a city with a much larger population than Auckland having only one main motorway, which doesn’t even travel near the CBD. 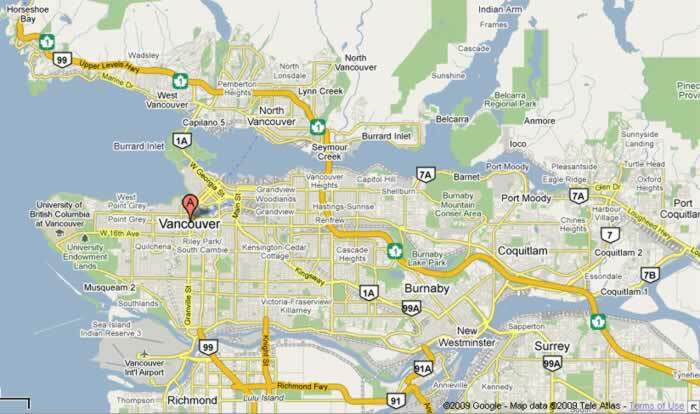 There are a few shorter stretches of motorway near Vancouver airport, but in general – as shown in the map below – there is only one main route through the city and that route stays quite separate from the central area: It’s entirely plausible that if our transport planner in the 1950s and 1960s had thought a little bit harder about things, and the politicians of the time had not ignored all the public transport plans of the time while wholeheartedly embracing the motorway plans, we could have ended up in a similar situation to Vancouver – with a central city not dominated by a massive motorway junction. Perhaps due to the lack of motorways in and around central Vancouver, the downtown area has intensified enormously from the 1960s onwards, while development nodes around the SkyTrain stations have brought huge numbers of people within easy access of the rail system. 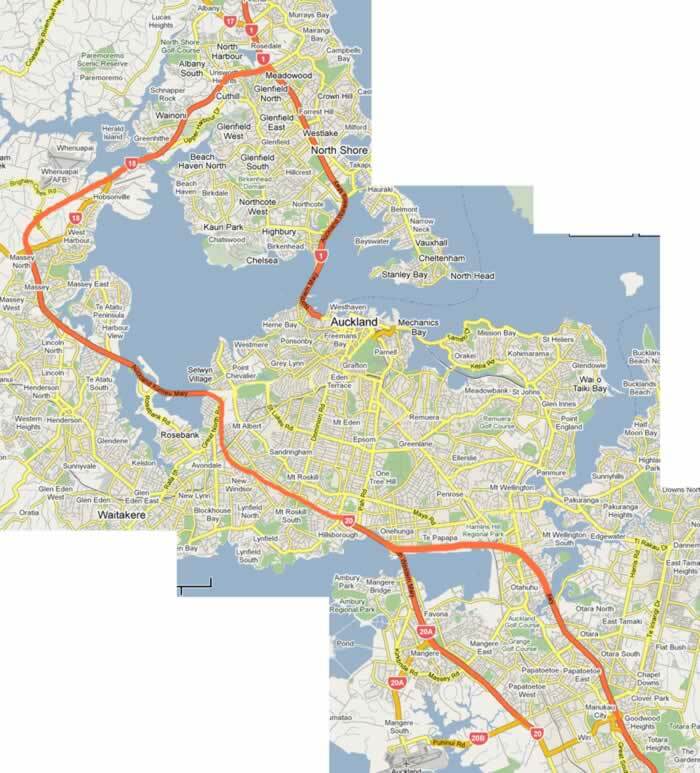 Wondering how things might have looked without the CMJ, I had a bit of a play around on photoshop to adjust Auckland’s motorway systems to a “what might have been”. The result is rather interesting actually – assuming that we had built the Western Ring Route and the Harbour Bridge, but not the inner parts of the Southern Motorway or the Northwest Motorway: Yes the Northern Motorway does look odd just “hanging there” and feeding into Fanshawe Street. However, in reality I imagine that if the motorway system had been built like this we would have probably seen far more development around the Whenuapai, Kumeu, Westgate area (top left corner of the map) and less on the North Shore. Furthermore, due to this system probably being significantly cheaper than what we actually ended up building (remembering that the Western Ring Route would have largely been through paddocks in the late 1950s) the money saved could have been put to good use on building the Harbour Bridge in a way suitable for carrying heavy rail. A crucial part of making this system work would have been building the CBD Rail Loop of course, as it would have been up to the rail system and the bus/tram system to link people with their jobs in the CBD. 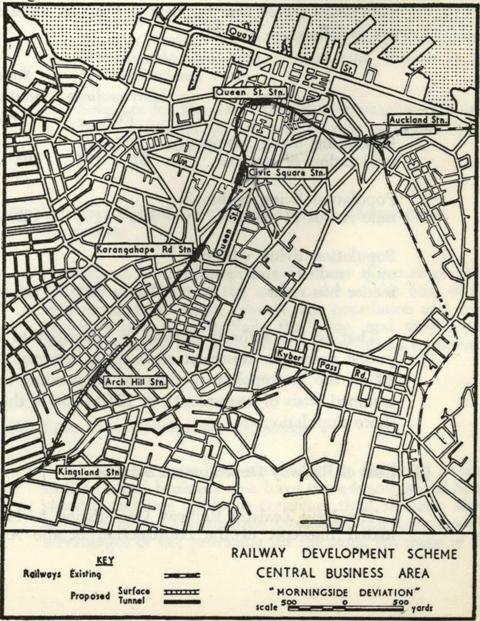 What often gets forgotten was that this project – originally proposed in the 1920s – was also proposed in the 1950s (and again in the 1970s, and again now, eventually it’ll be built…) Here’s a map of the proposal from 1956: I can’t help but feel that Auckland would have been a far nicer city had this “Morningside Deviation” been built, as opposed to the motorways that run through the middle of the city. Of course it’s too late for any of this now, but it’s interesting to think what might have been. One good aspect of the CMJ is that it forces density in the city centre. Without it would we have had a sprawling low density CBD? We’ve followed the Manhattan model – except our CBD is surround by motorway not sea. Our CDB has a motorway on one side and the sea on the other, is hardly call it surrounded by motorway. It’s not the motorway that contains density in the CBD, it’s the zoning. Question is whether we would have less permissive zoning without the CMJ wrapping around town? I don’t think so, Jimbo. Without the motorway and the local streets co-opted as motorway infrastructure, there would have been far more pleasant amenity between the inner suburbs and the city centre for both walking and cycling. And not just at a few points around the city centre – the connections would have been many, providing all sorts of easy routes. The outcome would have been vastly different, with residents of the inner suburbs valuing their walking and cycling connections instead of feeling that to get anywhere they need to go by car. With such a vastly different mindset, I don’t believe the NIMBY planning regulations would have been anything like as restrictive. A far more organic process of intensification would have resulted; I think we would have seen 3 and 4 storey apartments added to the inner suburbs during the 60’s and 70’s. People would be now treating them as heritage, and part of a more interesting mix of heritage from the 1800’s to the present day. I think the idea of a residential parking permit in the inner suburbs wouldn’t have arisen, either. Those streets wouldn’t have been given over to the car as much in the first place, and would’ve been used by the public instead of taken over as private car storage. Heidi that may have happened in an ideal world. I imagine more likely would have been planners under pressure to allow the CBD to grow further and further out. Although I guess this hasn’t really happened in the ponsonby direction so maybe not. Perhaps the difference is that you’re still using the term CBD when in fact we have a city centre with a high residential population. I think dense, mixed-use, pleasant-to-walk-and-cycle development spreading further out is exactly what we need, Jimbo. That’s not a city I would want to live in Heidi, that city would take forever to get around. Yes due to sprawl had to pick up family from the airport last night and drive 45 mins north via waterview to deliver them to other family members. He’s also ignored the improved travel times for people walking and cycling. Ours is a city that takes forever to get around! Ha, how long would that trip take on public transport? Could you even do that at all within a single day? Those distances are debilitating if you cannot drive a car. And yes, for me as well, any shopping which involves more than groceries turns into that kind of journey. I dont think if we hadn’t built the CMJ Auckland would have been more compact. The suburbs would still exist, I think people are dreaming if they think otherwise. Only takes too long on public transport because we have funded the motorway city we live in. They could of taken light rail all the way to Orewa in an alternative universe. OR the other locations to get to could by and large be more local. Mixed use and/or less spread out. Jimbo is right. The density in the CBD exists because the motorway ring contrains the area. The zoning is not the cause of density. Zoning only works when there is a reason for a change in density. If you don’t have a defensible boundary then there is no reason for politicians to stick with that zoning framework. They can and do approve just a bit more, then just a bit more. It is why geographical barriers and transport infrastucture matter so much more to cities than regulation in democracies. … but in this case, the mindset would have been different too, had the CMJ not been built. And that was the point of my comment above. European towns and cities were shaped by violence. They were compact so a defensive wall could be built and maintained. We look at them and think they are pretty and quaint but the truth is they were a response to the deadly times they were built. Once they sorted out law and order there was less need for castles and walls. From then on the towns and cities in places that had a future spread. The dead end places stayed small and quaint until tourism gave them an income. When the city walls were no longer deemed necessary they were often replaced with roads, as of course the walls, especially if complete and encircling, created a ready made right of way without buildings etc, once the wall was removed. This is where the word Boulevard comes from; from bulwark (or dutch Bolwerk), ramparts. The point was to made a grand, treed, and attractive promenade to knit the old inner and newer outer parts of the city together. A great example is the Ringstrasse in Vienna, exactly the line of the medieval city walls; with trams etc. The complete reverse, then, of a strangling and city limiting noose, which our post-war planners and engineers devised for Auckland, without even having a city wall to replace! Extraordinarily they invented one instead…what is more uncrossably destructive, more severing than a multilane m’way? And added exclusionary zoning on top to complete the segregation of the evil city from the good and proper suburbs; so the city cannot leap this divide. Incidentally the slummy bits somehow left undemolished by motorway building were to be bulldozed too… A programme that did start in Freemans Bay, and is visible still today, but stalled on the issue of class. The first housing programmes were too socialistic to last, and quickly returned to good old land speculation and from public housing (the Star Blocks; long since privatised) to quaint; the low-rise middle-class ghetto between Wellington and Franklin. Which, you’ll note, turns its back to these streets in an insular and neurotic form of permanent denial of place and social interaction (planned by a self-professed city hating planner, now dead, so i won’t name him). Miffy, those walls came down so long ago, in most cities most of the urban area is outside those former walls. There would be an area maybe 1 to 2 km across within those walls, compare that to the current size of Auckland. All those inner suburbs Heidi is referring to are outside the walls. Back in Birkdale, traffic is slowly but steadily increasing due to all those new townhouse developments. Every new one comes with a corresponding blob of cars parked permanently on street. We are too dumb to build those townhouses predominantly near PT routes, so you all those extra shopping trips by car… there is a solid wall of traffic on Mokoia Road any time during daylight. As I type this, at least two properties on my street are in the process of upgrading their fence to an 1.8m wall. One property has finished that upgrade a while ago. I used to cycle to work on Shakespeare Road which has a nearly continuous 1.8m wall from Kitchener Road to the hospital. That unnamed town planner… time has proven him right. It is even today still a dumb idea to build a development which faces the street. My guess is that without the CMJ the development that occurred in the CBD would have gone elsewhere. We would now have a CBD dominated by lowish heritage buildings. It would have been quite cool. But the car based development era would have passed the CBD by and now the planning struggle would be which buildings would have to stay and which could now be removed to allow for more jobs in the centre as public transport makes its big comeback. So miffy, you’re suggestion is that without the motorways we would have upzoned Parnell, Ponsonby, Eden Terrace etc and spread the city centre density more thinly over a wider area? Or without the motorways leading to downtown we would have not have zoning permissive of towers in the CBD at all? The latter is more plausible. Not sure if I agree the ‘convenient border’ hypothesis. If not the motorway then it would have been some other border. We don’t have a motorway in Quay Park but we still have a hard zoning boundary there. Every Plan change we do people ask if it is a defensible boundary. Decision makers will always want to know why is that appropriate where you have shown it and not the next bit over. Essays are written on this stuff. The old Auckland City Council went to great lengths to figure out a height limit for each bit of the CBD and it was based on a whole bunch of issues but always it was on the basis of being within the motorway ring. Without the motorway ring we would have had zoning and height limits but they would have been different. Yes port one interesting. Of course rail could of played a bigger part or you could have just had Grafton Gully with motorway south only access. the port might have done a sydney and moved somewhere else. I wonder if Wellington would be better if centreport was relocated. You might as well ask what if they had built the original North Auckland line as a through line from Britomart rather than a branch from New Market. We know why they went to Helensville but an alignment around the harbour and onto the Northshore would be a better option today I wonder if they looked at that before they decided to push north from Helensville. A look at wiki says they started construction north from Helensville in 1889. Yes, just think what our rail network would be like now. Conjecture that is a bit futile, it’s how we del with what we’ve got. Ted, I think it’s a worthwhile exercise, part of rediscovering the “power of the imagination”. Too many people are stuck in thinking that what we have is somehow logical, or natural, and it is not. We can turn this city around into a people-friendly, healthy, inclusive place for all ages and abilities. We can be a responsible city that cuts its carbon emissions. And in the process, there will be more to enjoy about life. But for this to happen, we need to harness the imagination of our residents so they’ll stand up and say, yes, that’s what I want. Also a useful reminder that we can, and have, grossly and fundamentally changed the shape of our city and the way our transport works. This reminds me of the the chinese proverb: “the best time to plant a great tree was 100 years ago, the second best time is now”. has anyone noticed the young people striking for their future? I wonder how the car centric future that seems to be in the minds of many will change and are we making enough allowance for that? We need to think not just of our carbon footprint but climate justice for those who want to share our affluent ways.